I am truly blessed to have some great friends and even more so that I have a couple of friends that are in the Top Mafia/BFF category. 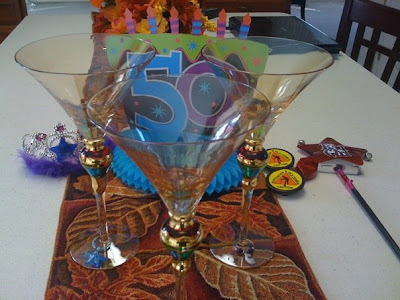 Well, this weekend is one of my Top Mafia's 50th Birthday (HandyHotNESSKY - Pattey) and we are about to embark on a wonderful weekend celebration. The thing that is even better about this weekend is I am getting to meet & hang with one of Pattey's BFFs. Now I've never met Soizik, but I've talked on the phone with her, we have FB IM'd and I've talked to her while I was with Pattey. Nevertheless, we always talked with each other as if we always had been friends and partners in crime. Why? Probably because we have a Top Mafia in common. Does this present a problem? Have I ever felt threatened by Pattey & Soizik's friendship? Have I ever not wanted to share or been jealous? NEVER. Not once. And for the life of me, I can't imagine why anyone would. I've heard stories about women who can't be friends with each other. Who get jealous or angry if you spend time with the other friend and you're not included. Who gossip and talk about the other friend when they are not around. I've heard about it, but I have not experienced it...perse. Like I said, I have some wonderful friends. I think that the reason I don't have those issues is because I choose not to deal with them. I'm just not going to have that conversation with you or hang around for some woman's (cause I have NEVER found any of this to be the case with men) petty jealousy or issues. If I discover that one of my friends can't handle me being friends (particularly tighter/closer) with another woman, then I'm going to do a mike check, note it and move on accordingly. I will "check you, boo" at the first sign/mention of jealousy, passive aggressiveness (ya'll know I hate PA byatchedness) or just plain ole girl craziness. You'll either deal or we are going to have to go on our merry way. And when we are in a group, I am of the school that when you have nothing nice/decent to say - Just Be Polite. No need for me to show you my azz (cause it will be in the form of a tazer); the crazy friend will show theirs eventually. In the past, if I valued our relationship and you were not snapping crazy with bullshyt on a regular, I would simply omit certain things that I know will get you upset. I may omit that I had lunch or hung out with so & so cause you are gonna be jealous or say something that causes me to test my tazer. Unfortunately, that policy stopped working a few years back when I started blogging, FB'ing and Twittering everything. Once my adventures became an open book, well, it became easy to separate the wheat from the chaff. Soizik and I had mentioned to each other via FB that we wanted to do something special for our BFF. Pattey is true Top Mafia to us both. We decided to share the cost of an airline ticket, picked my house to do the weekend slumber party, and decided on activities with the ease of friends who not only knew our BFF but knew each other pretty well...and I've only seen Soizik in pictures. I am so looking forward to celebrating Pattey's birthday this weekend....AND getting to know Soizik better (she has already been added to the friend list). We may not be each others BFF - being a Top Mafia BFF take history & time - but we are definitely gonna be fast friends. I'm so glad...so blessed to have Top Mafia like them. Do you have problems adding people to your friend circle?